Fork knows the ideal cooking temps for 9 different types of food LCD screen and lights tell you when your food is perfectly cooked Built-in LED flashlight allows for easy grilling in the dark Removable, dishwasher-safe fork allows for easy cleaning One-minute auto shutoff helps save battery life Temperature can be displayed in oF or oC Uses 4 AAA batteries (not included) Know when your food is cooked to perfection. 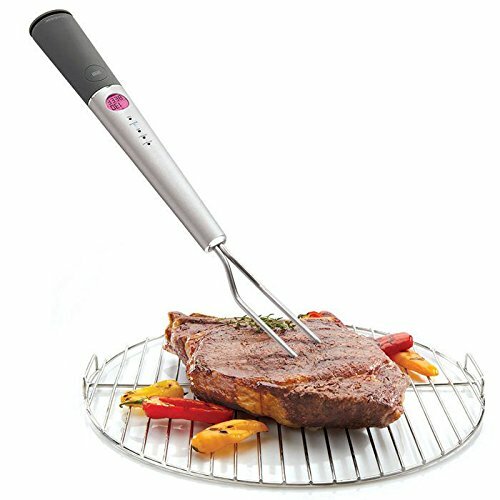 Chef’s Fork Pro lets you cook your food perfectly, every time. It features nine different food choices for an expertly cooked meal, no matter what’s on the menu–simply tell the fork whether you’re cooking beef, hamburger, veal, pork, lamb, chicken, turkey, fish, or baked potato, and it’ll tell you when your food is done!